After nearly 10 years of witnessing the U.S. economy and stock market recover—and thrive—investors are starting to wonder if we’ve seen all this expansion and bull market have to offer. At LPL Research, we believe there’s more room to run, thanks to strong corporate profits and continued fiscal stimulus, in the form of government spending, reduced regulation, and lower taxes. Against this backdrop, we expect gross domestic product (GDP) of up to 2.75% for the U.S. economy, supported by increased spending from consumers, businesses, and the federal government. Based on expectations for economic growth and monetary policy, along with the noted fiscal tailwinds, we expect 2019 may be another good year for equity investors. Accordingly, LPL Research forecasts total return possibilities within the range of 8–10% for the S&P 500 Index. With market interest rates climbing from historic lows, bond investors must be prepared for gradually rising rates, with periodic surges that may temporarily affect sentiment. As a result, we expect flat returns for bonds in 2019, as measured by the Bloomberg Barclays U.S. Aggregate Bond Index. Our conviction in the fundamentals supporting the economy and corporate profits is driving our forecasts for GDP growth and positive stock returns. Yet, many positive fundamentals could be pressured by threatening issues such as trade, deficit spending, monetary policy, or global politics. As a result, we do expect to see more volatility, and continue to encourage suitable investors to embrace that volatility for its potential opportunities to rebalance portfolios, rather than fear it. By managing our emotions and staying in tune with market signals, we can help position ourselves for any market environment. 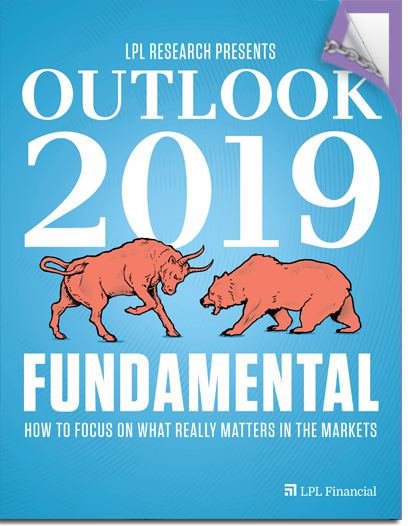 In addition, although our Outlook 2019 remains positive, we may be nearing the end of the market cycle. Thus, now is a good time to start thinking about what the next phase for the economy and markets may look like. The intention here is not to start worrying or assuming the worst, but to remind ourselves that slowdowns and declines are a normal part of our market cycle. And even more importantly, if we’re prepared for any downturns, we can be better positioned to weather any challenges that may be ahead. That’s where FUNDAMENTAL: How to Focus on What Really Matters in the Markets comes in—because we could all use a handy guide when it comes to this market environment. And at LPL Research, we want to make sure you’re prepared for what may be around the corner, or further down the line, and help you through it all. 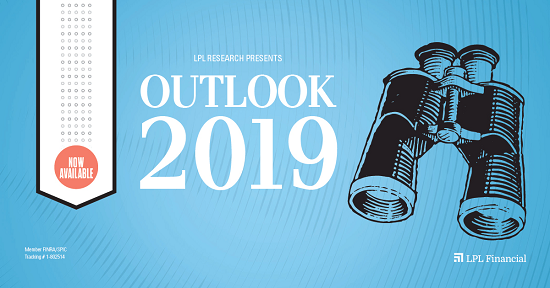 The LPL Research Outlook 2019 is here to provide insightful commentary, economic and market guidance, and our investment recommendations to help you navigate the year ahead. As always, if you have any questions, I encourage you to contact your trusted financial advisor.